Veterans in the job market have an exclusive opportunity to meet employers, receive job leads, and practice their networking skills: veterans job fairs, held across the country, are open only to veterans, transitioning service members, and military spouses. 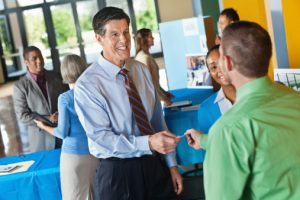 Job fairs are an opportunity for job seekers to speak directly to employers that either have current job openings, or are recruiting for future openings. Employers sign up to participate in veterans job fairs because they particularly want to hire veterans—who bring a range of training, work experience, and work ethic to the workplace. Besides possibly landing a job lead or an interview, attending a job fair can give you a better understanding of how to describe your military experience to civilian employers. It can also help you develop a list of types of positions likely to match your experience. And if the whole idea of asking for a job or meeting with employers sounds stressful to you, job fairs offer you a chance to practice with recruiters and human resources professionals who’ve signed up to be there, just to meet you and other vets. Most veterans job fairs are open to all service branches, although some target a particular branch, such as Sailors to the Workforce, or Soldiers to the Workforce. They are often sponsored by state veterans services, and attendance is typically free. To find state-sponsored job fairs, do an Internet search for “Veterans Job Fairs in (your state)”. For veterans who have a security clearance for their military job, find job fairs sponsored by clearancejobs.com. Recruit Military also sponsors a year-round schedule of veterans job fairs across the country, located either on bases or in the community. If there are no events scheduled for your area, or dates are not convenient, there are also a number of virtual career fairs listed on the Recruit Military site that you can “attend” online to interact with employers at a prescheduled time. Register. Although not always required, having your name on the list of pre-registered attendees shows professional courtesy to both fair organizers and exhibiting employers. Research participating employers. Find out ahead of time which employers hire people with your skills. Even if the company is not on your list of target employers, treat them as if they were. You’ll find a list of participating employers on the veterans job fair website. Make a list of questions for employers. Ask about how they recruit and hire people with your skill set. Practice your elevator speech. Begin with a firm handshake and good eye contact. Use a clear voice and provide the employer with concise and relevant information. It’s a good idea to practice with someone else. Bring several copies of your resume, pen and paper for notes, and breath mints. Talk with recruiters, but not for too long. Get business cards, names, and contact information. After meeting someone, make a few notes. What did you discuss with them? Did you commit to any follow-up? Talk with other job seekers at the job fair. Be professional, polite, and positive. If employers invited you to send a resume, be sure to send one out with a brief cover letter within a day or two of the job fair. If you picked up business cards or had a conversation with someone, stay in touch. Call if they offered to connect you with opportunities or leads, or to schedule an informational interview with them to learn more about a company or field. Send LinkedIn invitations to other job seekers you met as well as employer contacts. Whether in person or online, offer your assistance to other job seekers and members of your network when you request contacts in your targeted field or industry. Find more job search ideas on CareerOneStop’s Veteran and Military Transition Center.